One Laptop. Two epic battles. We all love arguing AMD vs. Intel, and AMD vs. Nvidia. The challenge is that you’re rarely comparing apples to apples. What if two apples fell right into your lap? 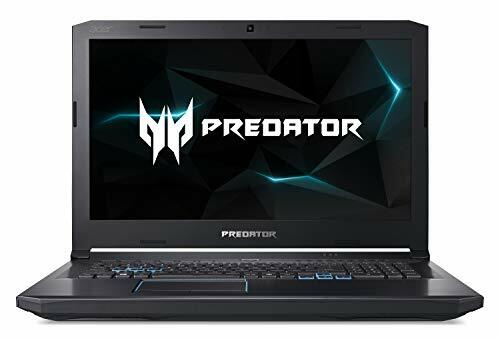 That’s what happened when we had the chance to test two of Acer’s Predator Helios 500 gaming laptops: one with an Intel CPU and an Nvidia GPU, and the other with all-AMD. With basically identical machines, we can answer some hard questions about which configuration makes the better high-performance machine. There’s so much to test here, between the CPUs and GPUs, and their different core counts, clock speeds, and technologies. So grab your popcorn and get ready to see two heavyweights in the ultimate gaming laptop fight. Face/Off: Intel and Nvidia meet an all AMD laptop. Fortunately, none of the brands have faded as much as Nicholas Cage and John Travolta’s careers. Display: 144Hz, 1080p IPS screen with AMD’s FreeSync. A note about the AMD version’s skimpy storage: There is a free M.2 slot and a free 2.5-inch bay—but there’s no connector for the drive. That’s just odd and makes the extra $300 for the Intel and Nvidia laptop seem well worth it. 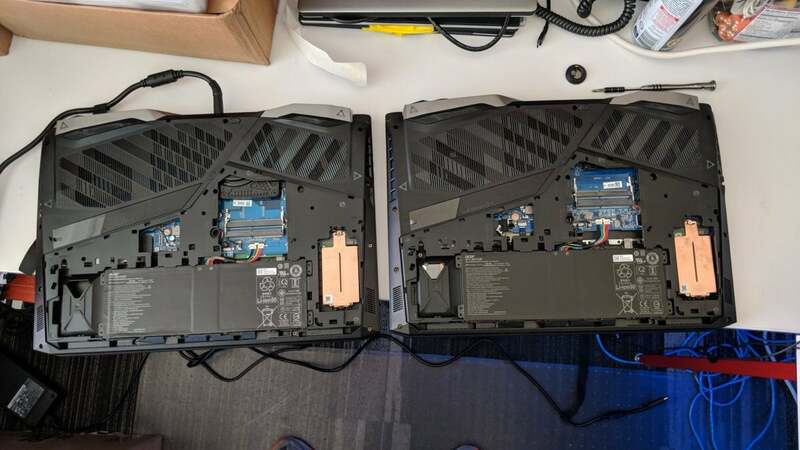 The two laptops basically appear to be the same except for the motherboard, CPU and GPU. In fact, we successfully removed the bottom cover from the Intel/Nvidia version, and snapped it in place on the AMD version. So yes, they’re about as close as you can get. 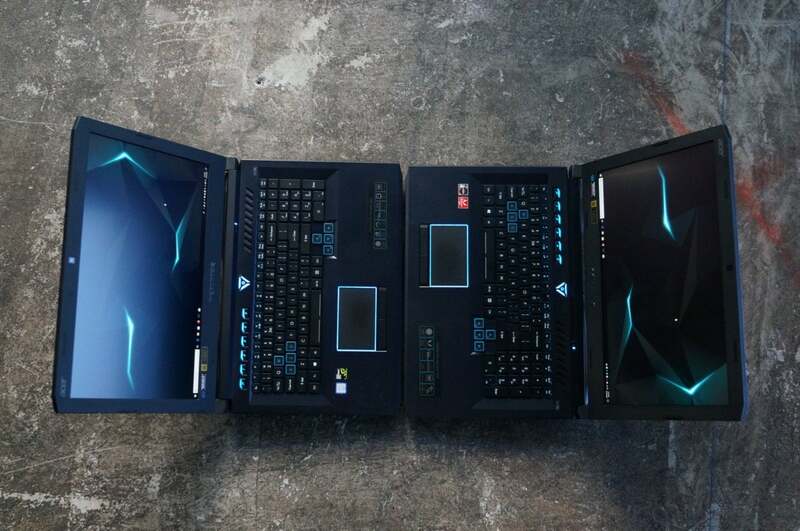 Acer’s Predator Helios 500, the version with AMD Ryzen 7 2700 and Radeon Vega 56 on the left, and the version with Intel Core i9-8950HK and GeForce GTX 1070 on the right. Except for what appears to be large heat sink on the AMD laptop, the rest appears to be the same. After testing both systems, one unexpected surprise was the fan noise. We expected the Radeon and Ryzen combo to sing all the time, but instead, it was the Core i9 and GeForce that droned on forever. The AMD version is among the quietest gaming laptops we’ve heard in a long time. In fact, it’s almost too quite and made us wonder if more performance tuning might be warranted. For our tests, we ran the laptops in stock configurations. Because the Intel/Nvidia-based laptop features a factory “Turbo” setting (which basically overclocks the CPU and the GPU when switched on), we also tested it with that enabled. We tried to squeeze a little extra performance out of the AMD Ryzen 7 2700 by using the included Ryzen Master to overclock it, but we failed to obtain even marginal clock boosts. For the most part; the Ryzen 7 2700 topped out with all cores and single cores at 3.4GHz to 3.5GHz. The Ryzen 7 2700 is rated with a base clock of 3.2GHz and boost clock of 4.1GHz. We suspect this may change as AMD and Acer get a better handle on it, but for now, this is what you get. The Intel CPU is rated at 2.9GHz to 4.8GHz. The clock speeds vary based on thermal and power load and how the laptop maker chooses to tune the system. The stock speed we saw on the Intel chip varied from 3.5GHz on multi-core loads to 4.5GHz on single-core loads. When set to Turbo we saw all-core loads of up to 4.4GHz and single-core loads up to 4.7GHz on the Core i9. While not all users will overclock, we believe it would only be fair to show a possible buyer what can be hit. Multi-threaded applications are still somewhat niche, but they are the best way to show off the full capabilities of today’s high-core-count flagship CPUs. Let’s kick off the competition with Chaos Group’s V-Ray benchmark. It’s a 3D rendering engine available as a plug-in for a number of popular modeling applications. Like most professional rendering engines, it loves CPU cores and threads. The more you throw at it, the faster it finishes the job. What you see below is simple math: The Ryzen 7 2700’s 8 cores > the Core i9-8950HK’s 6 cores. AMD takes a big win here against Intel’s most powerful Core i9 CPU. It’s a big win for AMD’s 8-core Ryzen 7 2700 against the 6-core Core i9-8950HK. 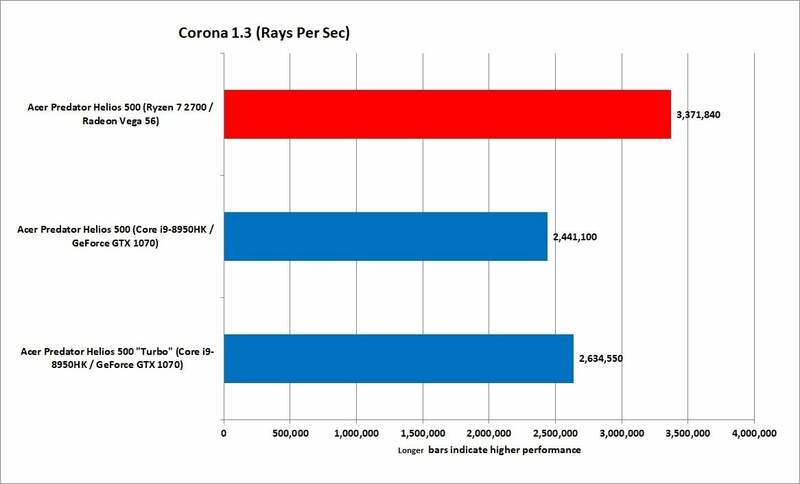 We see a repeat in the Corona rendering benchmark. Corona is an “unbiased photorealistic renderer” that works in 3ds Max. “Unbiased” refers not to its CPU preference, but rather to the lighting model it uses. 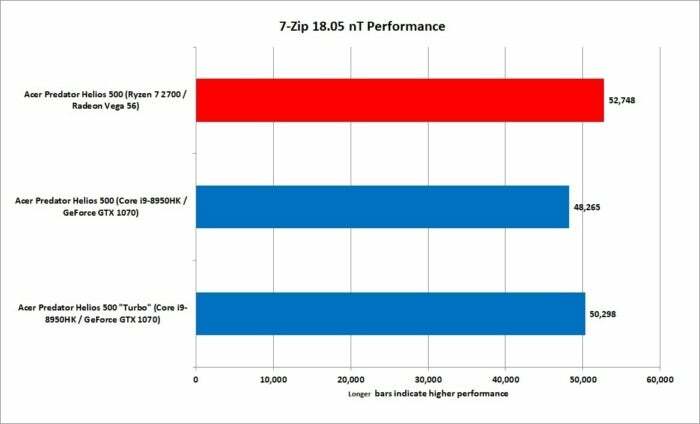 Again, the Ryzen’s 16 threads > Core i9’s 12 threads, and the AMD Ryzen 7 pulls out a very decent win against the Intel Core i9. Like V-Ray, the unbiased photorealistic Corona renderer prefers more cores to higher clock speeds. Core i9 finds its footing in another rendering test. Check out the Blender results below. Blender is an open source 3D modeling application popular with many indie movies. Like most 3D modeling apps, it favors more cores and more threads. Ryzen 7 2700 wins, but the margin is thinner despite having two more physical cores. When overclocked, the Core i9 gets so close you can call it a tie. As Blender shows, clock speeds can help sometimes, even in multi-threaded loads. 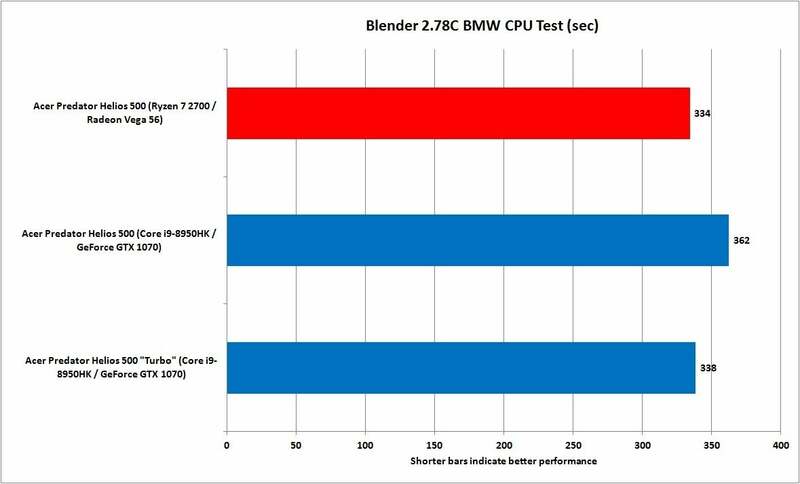 Despite having two more cores, the Ryzen 7 2700’s win isn’t quite as spectacular in Blender. 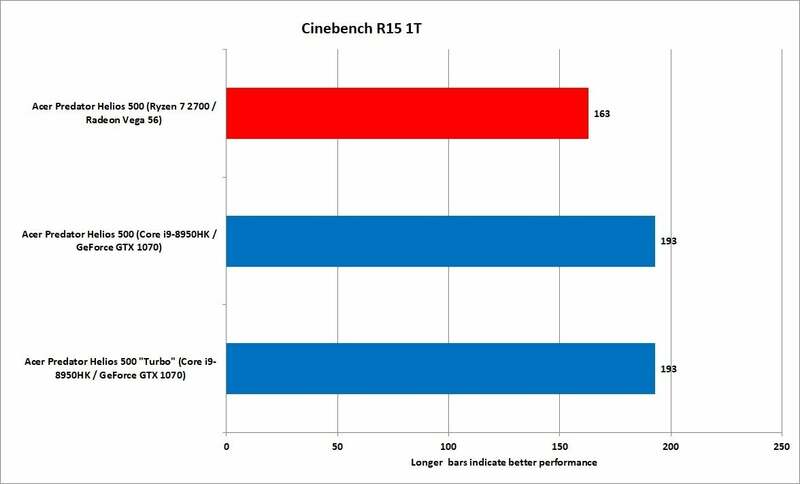 Our last rendering test is the ever-popular Cinebench R15. Based on a older rendering engine from Cinema 4D, the benchmark generally favors more cores than clock speed. But like Blender, sometimes the higher clock speed, or perhaps the design of the Core i9, just works better with it. Cinebench puts the Ryzen 7 2700 ahead of the Core i9—but not by much. Overall, we give the Ryzen 7 2700 the nod for 3D modeling tasks, but the story changes for our next category. To be fair, the multi-threaded benchmark in WinRAR has never really loved Ryzen. We’ve long suspected that it doesn’t like Ryzen’s Infinity Fabric or other mesh designs, because it also runs slower on Intel’s mesh-design Skylake X CPUs than it does on the mesh-free Broadwell-E Intel CPUs. 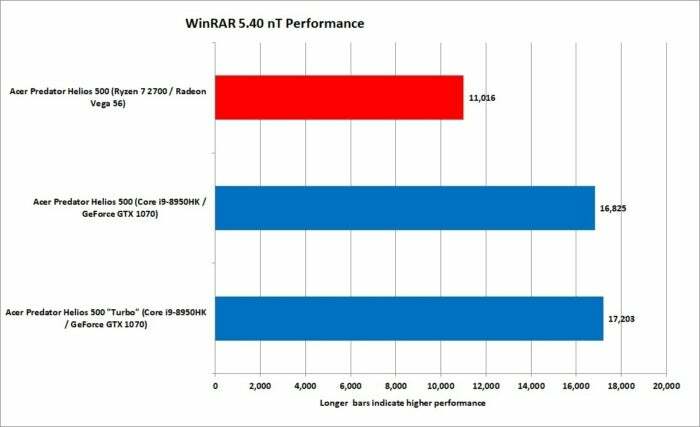 WinRAR has never favored the mesh-style Infinity Fabric in Ryzen, nor the similar technology in Intel’s Skylake-X. Moving on to the far more popular and economically priced (it’s free!) 7-Zip, the Ryzen 7 2700 pops back to the front of the line, but not by a huge amount for a CPU that has two more cores. The sub-scores show the Ryzen performing far better with the decompression tests, which leverage more memory bandwidth, than it does in the compression tests, which 7-Zip says push integer performance more. When you average out both, it’s a wash. Although the Ryzen 7 does better in decompression, its slower compression performance makes the 7-Zip result an overall wash.
Our last multi-threaded test uses the free HandBrake application to encode a 30GB file using the Android Preset in the free encoding application. 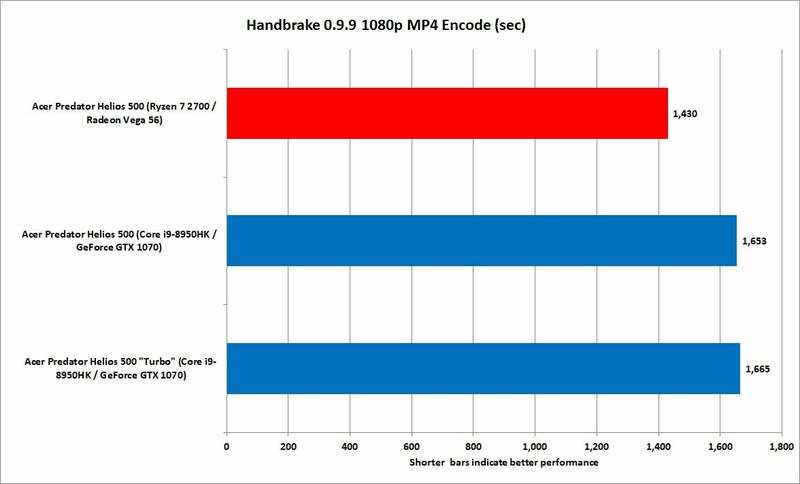 HandBrake favors more cores, and the Ryzen 7 2700 finishes this battery tests with a solid win. We can see from the Core i9 result that its Turbo setting doesn’t help it much. As the entire workload takes some 30 minutes to finish, that’s likely long enough for the overclock to run out of steam. The math is pretty simple on the multi-threaded tests, because 8 cores > 6 cores most of the time for these tasks. HandBrake favors more cores, and therefore the Ryzen 7 2700. 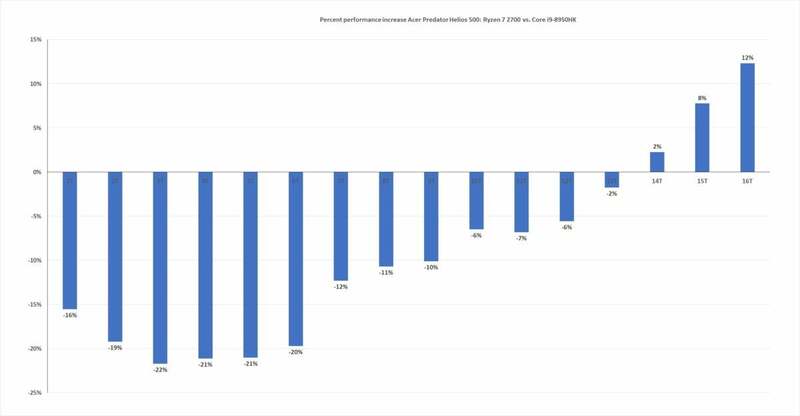 The test probably ran too long for the Intel CPU’s Turbo setting to make a sustained rally. Most mainstream applications still use just one or two threads at a time. 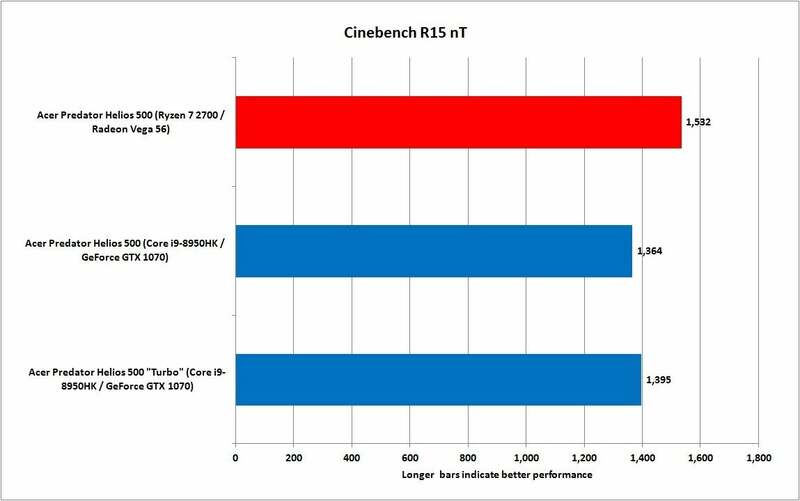 To gauge single-threaded performance, we run Maxon’s Cinebench R15, setting it to use just one thread. For the most part, the Core i9 and its superior turbo-boost performance on light threads put it far ahead of the Ryzen 7 2700 CPU. Pushing the Turbo or overclock button on the Intel-based Acer doesn’t help much because the single-thread performance is already pushing near 4.8GHz. The higher single-threaded clock speeds of the Core i9 put it well ahead of the Ryzen 7 chip. We also ran 7-Zip, POV-Ray and WinRAR using a single thread, and the results are nearly the same as what you see in Cinebench. The clock disparity puts the Ryzen 7 2700 at a loss. At this point of any Law and Order episode, they’d stipulate that the Ryzen 7 is unlikely to win any battles on single-threaded tasks. 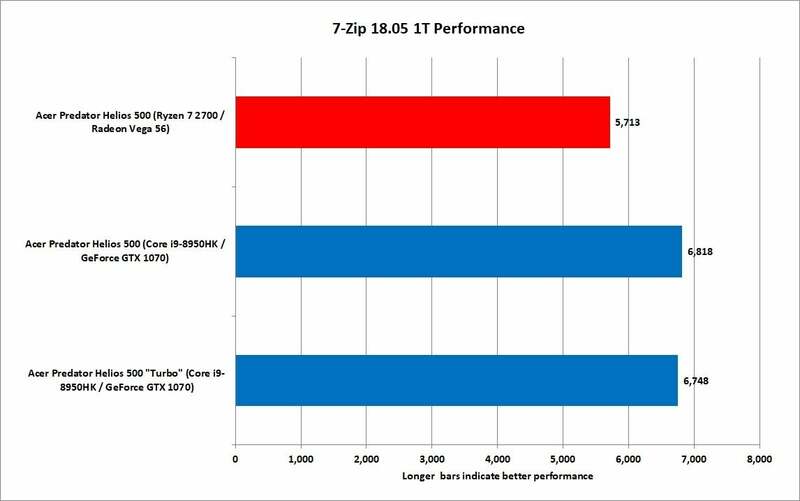 7-Zip just confirms that the higher clock speeds of the Core i9 make it faster than the Ryzen 7. We wanted to delve a little bit more into how the Ryzen 7 2700 performs against a Core i9 laptop CPU, so we use Cinebench R15 to run from 1 to 16 threads on both laptops. While 3D rendering may not be exactly what you do in Microsoft Word, or Photoshop or After Effects, it does give us a general idea of how the CPU in a laptop will perform under heavy to medium to light loads. 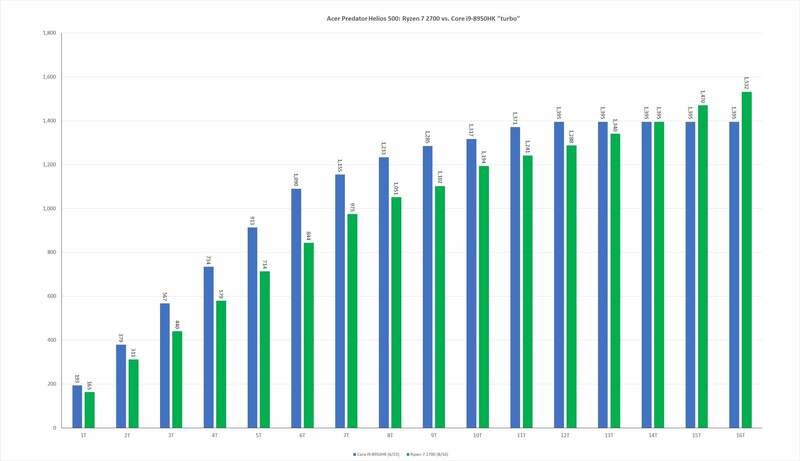 The chart below tells us the Core i9 outperforms the Ryzen 7 on light to medium loads. Ryzen 7 wins only on loads that stress 14 threads and up. We run Cinebench R15 from 1 to 16 threads to give us a general idea of how the CPU will perform under various loads. 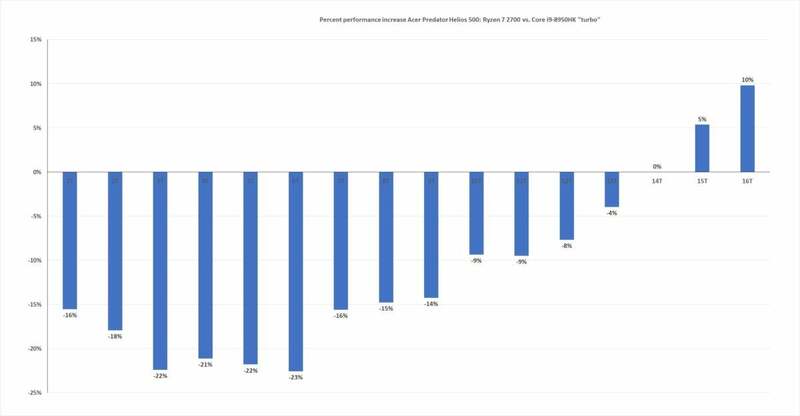 One problem with the overall score on the chart above is the loss of scale, so we also produce a chart that shows you the performance differences by percentage. As you can see, the Ryzen 7 gives up most performance to the Core i9 on the lighter loads, where the Core i9 is pushing much higher 4GHz+ clock speeds. Here’s how much the Ryzen 7 2700 gives up against the Core i9 on lighter loads. We suspect most of this is due to the clock speed advantage for Core i9. We also ran our test with the Intel CPU in “Turbo” mode, which opens up the performance gap even more against the AMD CPU. Set to “Turbo,” the Core i9 picks up even more gains. Here’s the performance difference again as a percentage based on how many threads the CPUs are tasked with in the Acer Predator laptops. Clearly the Intel CPU is likely to have a hefty performance in most of the applications people run. Remember: This doesn’t run counter to what you saw with V-Ray, Corona, HandBrake, and others, but those are applications that easily scale with the number of CPU cores. The 8-core Ryzen 7 maintains a lead mostly in applications that can squeeze the most performance out of a multi-core CPU. Most consumer applications can’t. 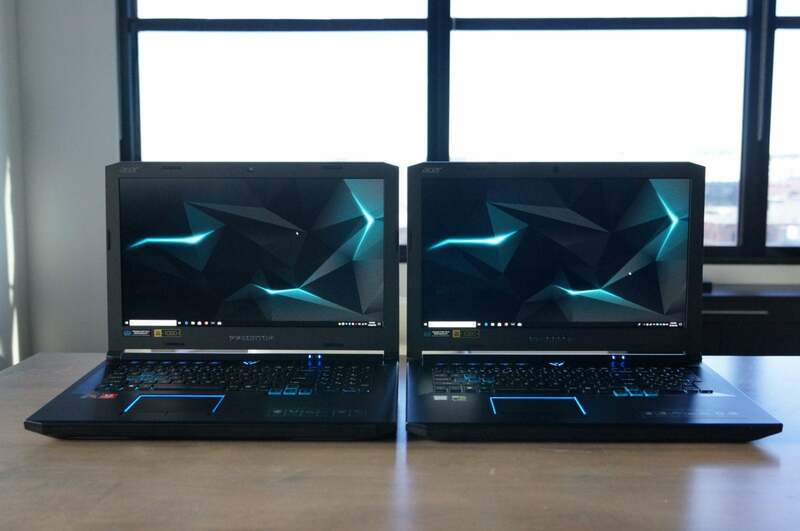 The GPUs in these two Predator Helios 500 laptops are rivals, too. We ran both on various games to see how the Radeon RX Vega 56 and GeForce GTX 1070 would fare. One thing that makes this a little messier than a normal GPU showdown is the CPU. In most GPU reviews you test the graphics card using the same CPU. With these reviews, we’re really factoring in CPU performance as well, because you can’t separate the GPU from the CPU. The old scream of “No one plays games at 1080p!” doesn’t apply, because both laptops feature 1920x1080p resolution screens with 144Hz refresh rates. For our testing, we actually disabled FreeSync and G-Sync, which can slightly drag down performance during benchmarks. 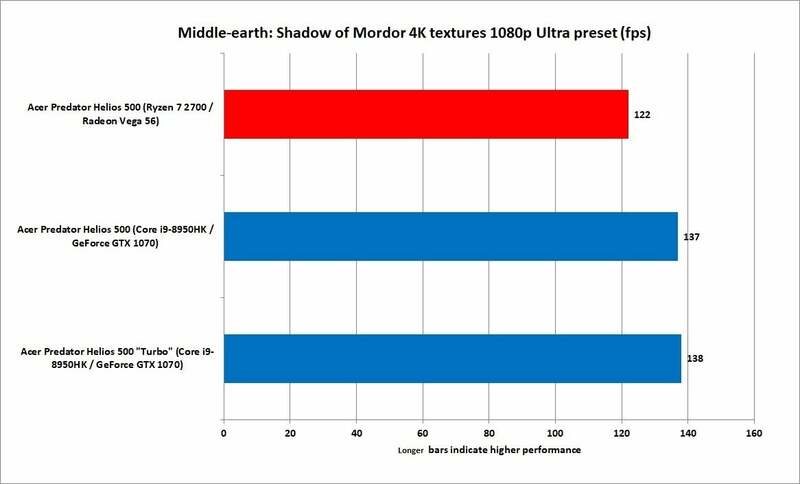 The first result is in Middle-earth: Shadow of Mordor, which was run with the 4k texture pack installed and with the Ultra preset. 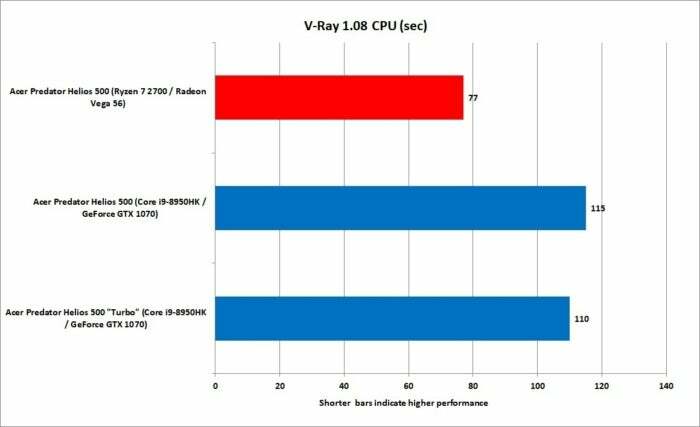 The results put the Ryzen/Radeon RX Vega team at a disadvantage to the Core i9/GeForce team. While there could be many reasons for the performance difference, the most obvious one is clock speed. Most games just don’t use that many threads, which means the Core i9 is going to be in front. We suspect the Ryzen 7 part holds back the Radeon RX Vega chip somewhat. The results in Shadow of Mordor are echoed in tests using Rise of the Tomb Raider with the Very High preset in DX11 mode. Team Red was again at a disadvantage. AMD actually worked with the Rise of the Tomb Raider developer to optimize for Ryzen last year and picked up a performance boost. That makes us believe much of the performance gain here could be the clock speed advantage of the Core i9 chip. Team Red takes a solid back seat to Team Blue and Green. In the 2012 vintage Tomb Raider, don’t expect any miracles for Team Red. The Core i9 and GeForce GTX 1070 continue to lead by a very familiar margin. Tomb Raider matches several of the other games giving the advantage to Core i9 and GeForce.